Cranberry Fluff, the world's greatest ambrosia. In many respects much of the food I spend a lot of time thinking about resides in the perfect center of the "Eew!," "Aaaww," and "Hmmm..." triangulation. For me, in the spectrum of responses that people seem to have to many of the foods I have enormous affection for, ambrosia is situated not far from the location of Jell-O dishes: foods you either tuck into with a fond remembrance, or you peer suspiciously at on the table. My mom never made ambrosia, but my grandma sometimes did, and often there would be ambrosia salads at our family reunions on my maternal grandmother's side. It was one of those exotic, familiar, and comforting dishes that I loved getting to eat when we got together with three generations of my granny's fam (also included were home made root beer, and creamed chipped beef on soft rolls). So let's talk about ambrosia: it's really good. Why, you ask? It’s got an incredibly unique and satisfying mouthfeel. It's an ideal party food because it's colorful, fluffy, and sweet. It features mini marshmallows, and whipped cream. For me, that last sentence hyperspace jumps us right into what more needs to be said? so I’ll stop here. Because, while I have a lot to say about the merits of ambrosia, my words are wasted if you’re against the ground-breaking formula of mini marshmallows + whipped cream. If you flinch at that, well, what can I do with you? In a week or two you can read about my mom's meatloaf, or my landlord's mac and cheese. In the meantime, below lay my arguments for why you should be into, if not any ambrosia, at least this ambrosia. Pretty much all ambrosia involves whipped cream, fruit, and mini marshmallows. A lot of times it has coconut, pudding, or sour cream. This one has none of that a lot of times stuff, but instead features cranberries, and it’s perfect. It’s super tart, it’s a fabulous shade of pink, and as mentioned earlier, it’s incredibly fluffy. 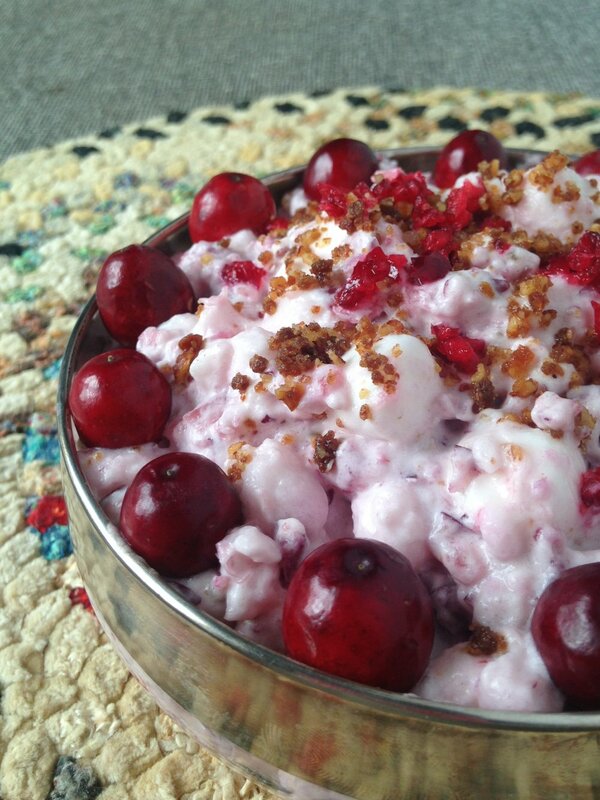 The magic of Cranberry Fluff is the way the basic ingredients work against each other creating an ideal polarity. See it goes like this: the cranberries (super tart) get a sparkly spin with the addition of sugar. The pillowy soft super sweet mini marshmallows get an acid bite from the canned crushed pineapple. Better still, the acid in the pineapple breaks down the marshmallows, and makes them less buoyant, and more slick – kind of like the magic that happens when you cook them for, say, a cornflake wreath (see what I did there? ), but you maintain some of the airiness because they don’t break nearly all the way down. And then you add the whipped cream, which is of course, the lynch pin. That's where it all comes together and alchemizes into fluff. I think ambrosias are really good with nuts, and if you do too, you can add chopped pecans, toasted or raw. My cousin Frances got this recipe from someone, at some point in time, and has been making it for ages. It's a Thanksgiving staple on my dad's side of the family, largely due to her making it for all the family events, and because cranberries = Thanksgiving. (Ahem, Christmas too). Whenever we go to have holiday meals with my extended family on Dad's side, the excitement for Cranberry Fluff is palpable, and discussed well in advance. I think, like many American classics (queso cheese dip, green stuff jello salad, sherbet punches), that cranberry ambrosia must be one of those recipes that has just kind of made the rounds, one way or another. Exhibit A: this handwritten recipe card I found on the interwebs exactly mirrors the recipe my cousin Francie gave me. 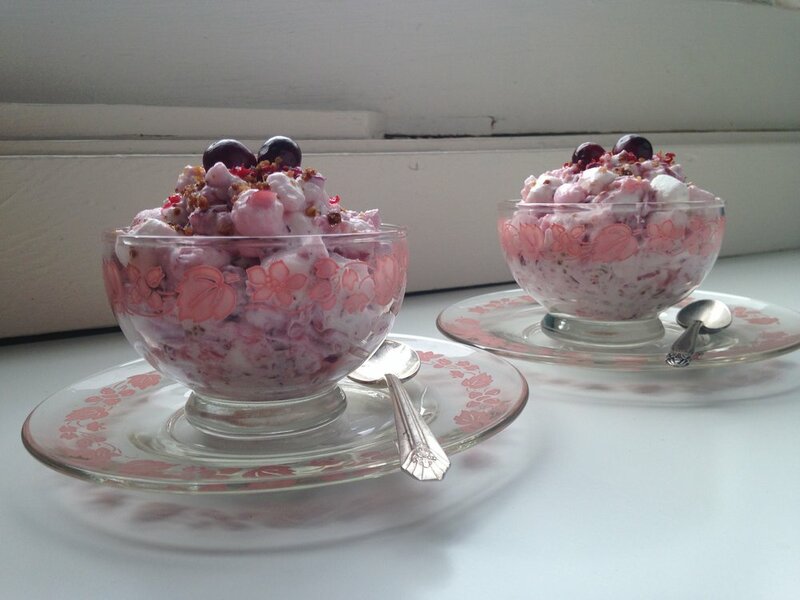 While it is generally regarded that Cranberry Fluff is a holiday dessert, IMO this dish is good enough to be served other times of year, and is the perfect color for Easter, or just any pink themed meal (yes, I have totally made a pink & green themed meal before). So, buy your cranberries now and freeze them for later in the year. Just be sure to grind them up and combine with sugar before you freeze them in pre-measured batches. Also, I love ambrosia because it is belongs to the incredibly paradoxical and yet totally perfect category of dessert salads. Grind the cranberries in a mini chopper. I use my mini Cuisinart. Decant the cranberries into a bowl, and stir in sugar. You can reduce the sugar by as much as a ½ cup, which is what I do. Let the sugar draw the juice out of the cranberries while you prepare the next 2 steps. In another bowl empty the drained can of pineapple and stir in the bag of mini marshmallows. Let the acid in the pineapple break down the mini marshmallows while you whip the cream. Whip the cream. Once it’s whipped, you’re ready to go. Combine all parts. First, add the cranberry/sugar & pineapple/marshmallow mixture together, if you are including nuts, mix them in now. finally, fold the whipped cream in. Recipe from my cousin, Frances Wyss, who serves it frequently throughout the year, and hipped me to the freeze ahead part. You can pre-mix the cranberries & sugar together, and the pineapple & marshmallows together quite a while in advance on the day you will serve it. However, it’s best that you don’t whip the cream until you are pretty close to serving it. You can use as little sugar as you like, though the cranberries do need some sugar to draw out the juice. Don't reduce too much, even if the marshmallows and pineapple provide enough sweetness for your palette. Frankly, most of the quantities are not hard and fast in this recipe. Feel free to play with the ratios - you might like it to have more marshmallows, less whipped cream, and a ton of chopped nuts. Do your thing, and tell me about it if you make any great discoveries. For reasons detailed above, don't sweeten your whipped cream. It also needs no vanilla. Because the acid in the fruit will break down the whipped cream, this dish will be at it’s fluffiest just after you fold the ingredients together, and it will only last a few days as leftovers before it really changes texture. I garnished with some reserved ground cranberry/sugar mixture, nuts, and raw cranberries. Do what your heart tells you here, even if it's just skipping the garnishes altogether, and sitting down in front of the TV with a tablespoon for a Netflix and chill party of one. HOT LINKS! linking up hot.